Don't head off to your business meetings without the professional-looking MeetingMate Notebook with Pen and Sticky Flags! 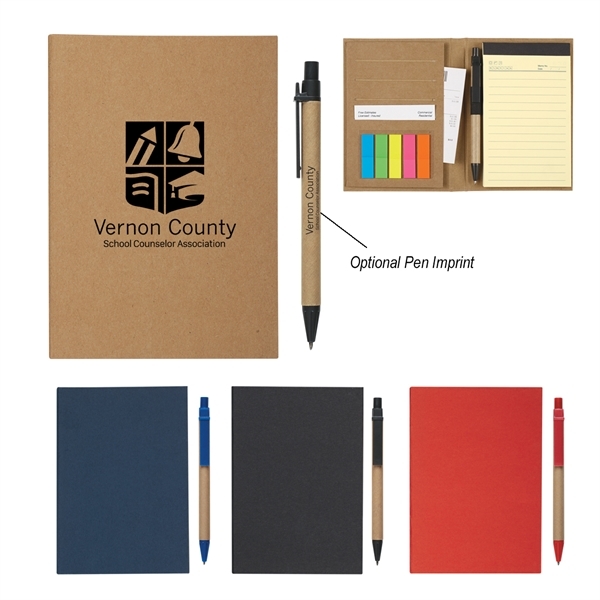 It comes with a matching pen that has a paper barrel and sticky flags in five neon colors. It has four card holders, an interior expandable pocket, a pen loop and a 70 page lined and recycled memo pad. The paper cover is perfect for featuring your company's name, logo or marketing message. Make sure your brand gets seen! Size: 4 7/16 " x 6 1/4 "
Imprint Size:3" x 5", 1 1/2" x 5/16", 1" x 3/4"